At the close of the market on Monday, Apple hit an all-time high of $133.29, breaking the previous record set on May 22, 2015, with market capitalization again flirting with $700 billion. 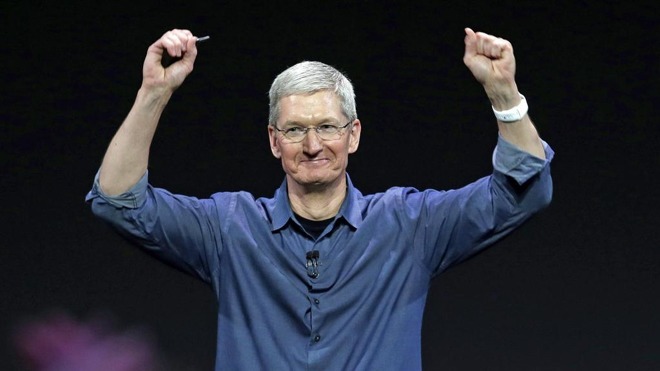 Apple stock continues to be buoyed by a stronger-than-expected quarterly earnings report. The earnings report was led by the blockbuster debut of the iPhone 7 series and Services revenue, with Apple reaping a record-setting $78.4 billion in revenue and $17.9 billion in net profit. The climb has taken nearly two years, with the last peak of $132.54 hit at the close of business in May 2015. Today's surge was aided by a pair of reports on Monday morning, claiming that Apple's Services revenues were undervalued by investors, with one claiming that the stock was undervalued by as much as 10%. Defying post-quarterly earnings report trends, Apple stock rose over $7 on Feb. 1, the day after the Apple quarterly earnings report, and has not fallen below $128.53 since Feb. 2. Thursday's peak may not be the end of the tale, however. Analyst Ben Schachter of Macquarie predicts the highest 12-month valuation for Apple out of all the analysts at $156. In a note to investors, Macquarie said that the continues growth of Apple's "Services" business should command more attention going forward, and continue to propel Apple profits. Other investors are less bullish, but still expect to see Apple climb to between $140 and $150 per share in fiscal year 2017.